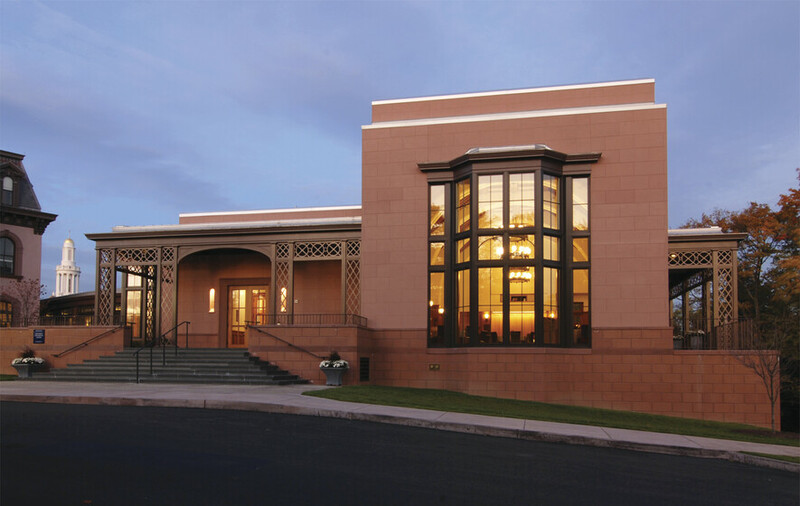 The new Maurice R. Greenberg Conference Center provides an environment conducive to information exchange and is a highly public example of the university’s commitment to sustainable design and global climate protection. Entering from the front porch, guests are greeted by illuminated niches carved into the brownstone walls. 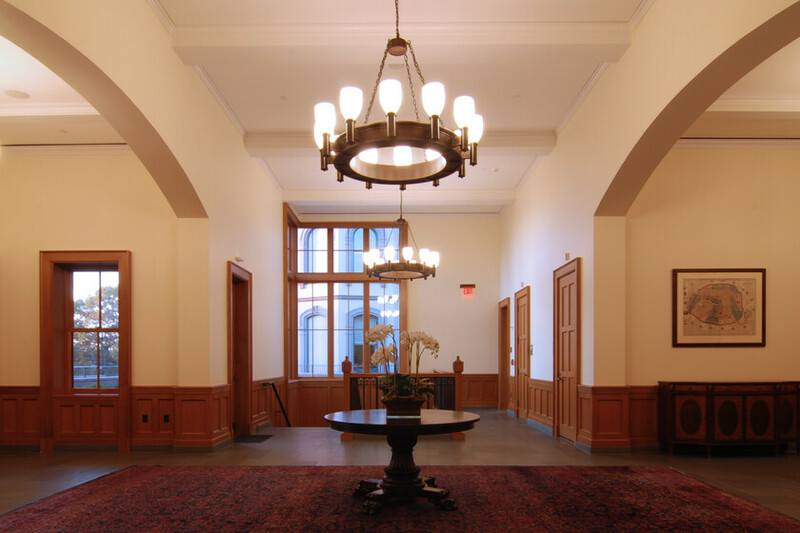 The thoughtful lighting system creates the glow of a decorative interior, providing the building’s nighttime identity. Inside, the foyer establishes the warmly decorative design approach, using large-scale custom pendants to illuminate the space with compact fluorescents softened by luminous white glass chimneys. Detailing on the pendants echoes the decorative cross-hatching motif expressed in the woodwork and metalwork, tying together finishes and geometric patterns across many architectural elements. Ambient lighting is provided by dimmable drum luminaires augmented with compact fluorescent downlights and wall washers as well as halogen adjustable accent lights to meet audiovisual requirements. Beyond providing visual elegance while appearing like traditional decorative lighting, many features of this system were designed to meet the building’s sustainability goals. 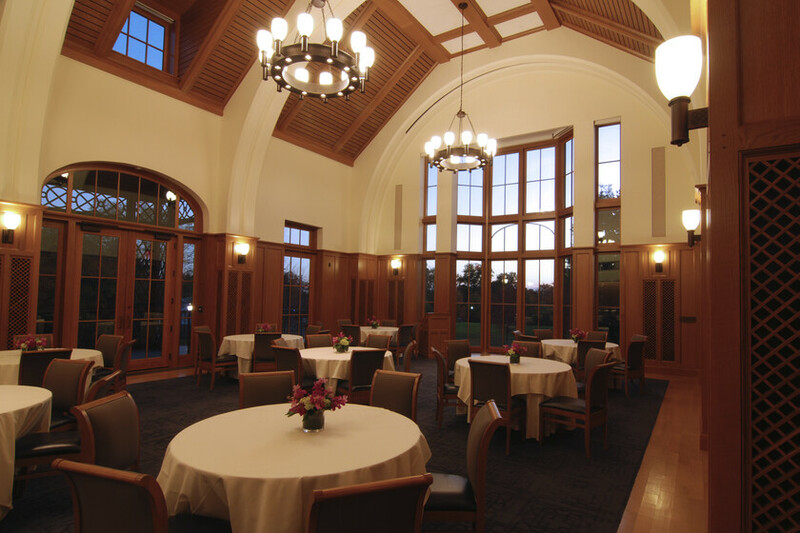 In the dining hall, which serves as the primary reception space, pendants combine dimmable 3000K compact fluorescent ambient lighting with separately controlled halogen PAR20 accent lighting, providing maximum program flexibility. High efficiency luminaires reduce the lighting power density below ASHRAE 90.1-2004 minimum requirements and occupancy sensors are installed in all regularly occupied spaces to reduce lighting power. The classrooms, lecture hall, offices, and social spaces are designed to maximize indoor air quality as well as thermal and visual comfort. Total site energy consumption is reduced by 49.3%, which is directly attributable to the ground source heat pumps that make up the primary heating and cooling systems.